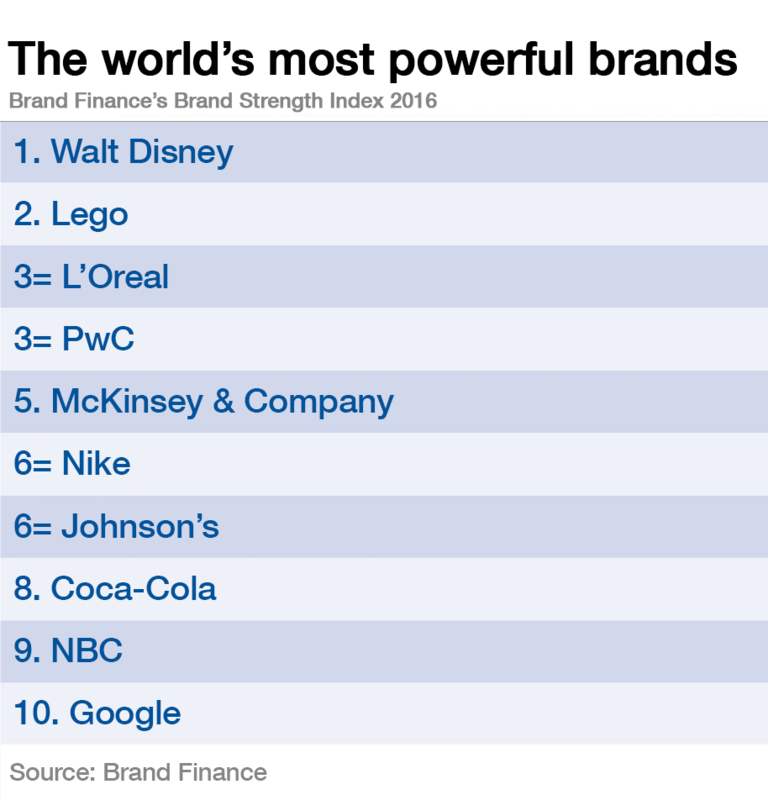 Walt Disney is the world’s most powerful brand, according to this year’s Brand Finance rankings. By overtaking Lego, the makers of Cinderella and Mickey Mouse, and latterly the new Star Wars film, have been named the world’s most powerful brand, based on a number of factors including loyalty, promotion and staff satisfaction. Following Disney is Lego – dropping from first place, which it held last year. Despite being the least valuable brand in the top 10, at least in terms of the money involved, Lego ranks second for brand strength. Joint third place goes to L’Oreal and financial services company PriceWaterhouseCoopers. Massive household names dominate the top 10, and only one technology firm makes it in: Google in 10th place. The top 10 is calculated by awarding each brand a score out of 100, based on “factors such as familiarity, loyalty, promotion, marketing investment, staff satisfaction and corporate reputation”. To make this year’s top 10, a brand needed to score in excess of 89.5 out of 100. How has Disney done it? The report believes Disney’s success is founded in its rich history and original intellectual property. Characters such as Mickey Mouse and Donald Duck underpin the brand and are internationally recognized. However, its dominant position today is the result of acquisitions and the powerful brands under its roof. The purchase of companies such as ABC, Pixar and Lucasfilm have helped secure the company’s position at the top of the ranking this year. The report argues the success of the latest Star Wars film, which broke numerous box office records in 2015, has been especially important. Which country has the most valuable national brand? How can companies survive in the digital age?